Want to know how your earbuds make music, how telephones squeeze sounds down wires, why broadband is faster than dialup, or how science can make you happy? You've come to the right place! 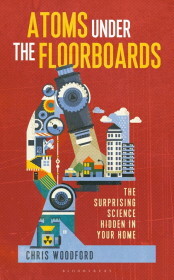 Explain that Stuff is an online book written by British science writer Chris Woodford (author of many popular science books for adults and children, including Atoms Under the Floorboards: The Surprising Science Hidden in Your Home). 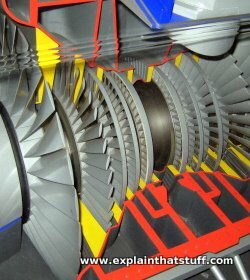 It includes 450 easy-to-understand articles (plus over 2000 photos and 1000 illustrations), covering how things work, cutting-edge science, cool gadgets, and computers. We take the "pain" from explain and the "tough" out of stuff! There's more information on this website than in your average expensive science book, it's continually updated, and it's completely free to use! 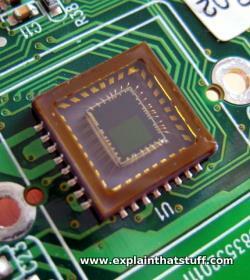 Explain that Stuff also helps to support curriculum learning (conventional STEM education and home-schooling). Water pollution: Rivers and seas take a long time to recover from the effects of careless human treatment. What causes pollution and what can we do to stop it? Electricity: The most versatile and useful form of energy in our world, electricity is going to become a whole lot more important in future. Nanotechnology: Can we build a brave new world just by shuffling atoms and molecules under a microscope? Magnetism: One of the first bits of science people studied, magnetism is still just as relevant today in everything from electric cars to body scans at the hospital. Gears: Wheels with teeth carved around them can make you go faster or bump up your power—and here's how! Wind turbines: Why does a wind turbine have to be so tall—and what keeps the lights on if the breeze stops blowing? Batteries: We all need electricity, wherever we happen to be, so thank goodness for batteries—miniature power plants you can carry in your pocket! Electric motors: These amazing machines turn electricity and magnetism into movement, powering everything from handheld toothbrushes to bikes, cars, and trains. Air pollution: It's often invisible, but air pollution can be just as damaging as water pollution and sometimes travels much further. What causes it—and how can we clean up our act? Global warming: Why is the world getting hotter and what can we do about it? What will be the consequences for humankind and the rest of the living world? Cloud computing: Why buy yourself an expensive computer or programs to go with it when you can get access to something just as good over the Internet? What else is on our site? The hundreds of detailed articles on our site are divided up into a number of broad topical areas, which we've listed below. We've also given you a rough idea of the kind of questions you're going to find answers to in each section! Computers: How can you make a computer think like a human brain or cause climate change inside your PC? Who invented the computer—and why on Earth did it take them so long? Electricity and electronics: How can you make coffee with a stream of electrons? How can magnets detect burglars in your home? Energy: How does wind energy come from the Sun? Is nuclear power safe or not? Engineering: What stops a bridge falling over? How come a person can lift more stuff with a crane than with their bare hands? Environment: Can we still stop dangerous climate change? What causes air and water pollution and how can the world clean up its act? Gadgets: How does a flash memory card store your holiday snaps? Why can a synthesizer mimic any musical instrument that's ever been invented (and even ones that haven't been)? Home life: How can you make windows turn dark at the flick of a switch? How does an artificial leg work? If an energy-saving lamp saves energy, how come it still makes exactly the same amount of light? Materials: If you had a piece of platinum as big as a man, how much would it be worth? Why doesn't a dry-stone wall fall over? Is it true that glass is a kind of liquid? Science: Which part of a candle flame is the hottest? Why does chocolate actually taste good? Where's the best place to sit on a rollercoaster if you want to scare yourself to death? Tools, instruments, and measurement: How does an iris scanner recognize your eyes? Why don't fireproof clothes catch fire? Can a robot really learn to play drums? Transportation: If a man can't fly, how can a plane fly if it weighs as much as 5000 men? How come we say a wheel reduces friction if it's got a tire that grips the road? Follow us on your favorite sites! Now you've found us, don't lose us! Why not join our friendly Facebook page, where we post cool science and technology news? You'll find our photos on Flickr. We regularly add new articles and constantly update and improve our older ones. If you use RSS, subscribe to our articles feed to find out about new stuff as soon as we publish it. Like this site? Get the book! Why do skyscrapers wobble in the wind? Why can't you cool your home with a giant block of ice? Could you microwave your dinner with a cellphone? What's the hidden connection between a bicycle and a suspension bridge? If questions like this are constantly buzzing round your brain, you'll love my new book, Atoms Under the Floorboards: The Surprising Science Hidden in Your Home, published worldwide by Bloomsbury. Please click here to find out more.